They live in Chennai, Tamil Nadu, Southern India. Since 2008, their base of operation throughout India has grown from 20 churches to 125 churches and 19 Educational Centers in the country. They are the proud parents of two children, Issac and Beverly. This will be their first visit to Boston. Serving God has been a central theme in Rev. Minnie Sarah Peddiny’s life since she was a teenager. 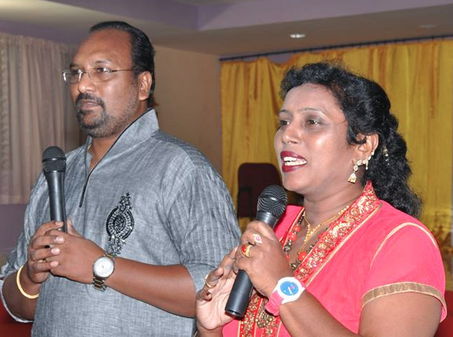 She was born and raised in Southern India and was “born again” in the church in 1984. She has been preaching the gospel throughout India for years. For two years, Rev. Sarah served as a volunteer in Operation Mobilization India (OMI), a worldwide evangelical organization. While at OMI, she met and married a fellow worker Rev. Abraham Peddiny in 1993. Through the years, Rev. Sarah completed her theological studies and received her Bachelor of Divinity (BD), Masters in Theology (M.Th.) and Master of Arts in Christian Studies (MA). Her previous employment included work for the Lutheran Church in India, serving as the Secretary for Women’s Desk in the United Evangelical Lutheran Churches in India. In 2003 African American seminary exchange student, Rev. Karla Cooper, met and formed a friendship with another student at Gurukul Theological Seminary in Chennai: Indian born Rev. Minnie Sarah (Peddiny). Rev. Cooper shared church history with Rev. Sarah and told of the visionary leadership of her church’s co-founder, ex-slave and first elected and consecrated bishop of the African Methodist Episcopal Church (AME), Richard Allen. It was a match made in Heaven.The friendship of Rev. Sarah Peddiny, Rev. Karla Cooper and Rev. Abraham Peddiny ultimately led to the formation of AME India in 2007. Under the direction of Bishop John Bryant and Rev. Cecilia Bryant, Rev. Sarah and Rev. Abraham Peddiny were appointed to the position Presiding Elders for the African Methodist Episcopal Church in India. To this date, they remain the only Presiding Elder couple in the worldwide connectional AME Church. Rev. Sarah has been blessed with spiritual gifts of prophecy, discernment, healing and exorcising evil spirits. Her achievements have taken her to eight countries by way of mission work through God’s grace. Her enthusiasm for helping the Dalit community (India’s outcastes) remains a thrust of Rev. Sarah’s great calling to humanity. Scholarly pursuit and spiritual outreach have been connecting forces in the life of Rev. Abraham Peddiny since an early age. He was born and raised in Eastern India and was “born again” in the church in 1984. For six years, Rev. Abraham served as a volunteer in Operation Mobilization India (OMI), a worldwide evangelical organization. While at OMI, he met and married a fellow worker Rev. Minnie Sarah in 1993. Rev. Abraham’s work with Operation Mobilization India took him across India and Nepal. During that time he served as a volunteer on the ship MV Doulos, along with people from 50 nations. The ship has entered the Guinness book of records as the largest floating book exhibition in the world. Following his work with OMI, Rev. Abraham completed his educational training and received his Bachelor of Theology (B.Th), Bachelor of Divinity (BD), Masters of Theology in Comparative Religions with a special emphasis on Islam (M.Th) and Master of Arts in Christian Studies (MA). He has taught in a number of well respected national seminaries in India before being invited to help establish the African Methodist Episcopal Church in 2007. Rev. Sarah and Rev. Abraham are the proud parents of a son and a daughter: Hans Isaac, a third year Dental student and Beverly, an 11th grade student.